Matthew Barnett is one of the founders of the Dream Center in Los Angeles. His father, Tommy Barnett also helped his son start the Dream Center. Matthew first started preaching at the early age of twenty years old at Bethel Temple in Los Angeles. When the church began to dwindle from thirty nine people to zero, Matthew cried out to God asking him why members of the church were leaving. He eventually found out his answer from God. God was calling him to lead and assist the homeless, broken, and hurting people in Los Angeles. The Dream Center believes in loving people and serving people. They hope hurting people will come to know that Christ loves them completely. The Dream Center helps drug addicts to recover, prostitution victims, human trafficking victims, homeless families, and anyone who is hurting to make a better life for themselves. In “The Cause within You”, Matthew shared his whole story about how God provided the money to start the Dream Center. The Dream Center has helped a great number of people who were hurting and broken and changed their lives around for the better. God has used the Dream Center to start a new different kind of church to reach out and bless others who are hurting. I liked that the book shared an enormous number of stories about people being changed by another person’s love. This book encouraged me to never give up and to always give God the credit for my cause. I would recommend this book to teenagers, college students, and adults. Everyone needs to find the special cause that God has for them. 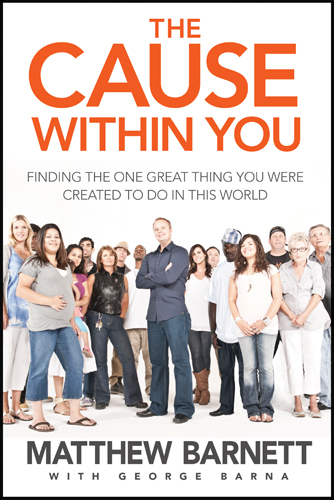 This book will help guide you on how to find out what your cause is. Most importantly is to remember that God will lead you to where you need to be at the exact time. If you fail from time to time just remember to never give up on your cause! God will always show up when you need Him. All you have to do is to seek God and he will provide. Near the end of the book, Matthew also included some Bible scripture passages to meditate on and encourage you on your journey to fulfilling your cause.